Yakutat Tlingit Tribe Cultural Heritage Department Director Gloria Wolfe will receive the Language Warrior award on April 12th, 2019 at Central Council of Tlingit and Haida Indian Tribes of Alaska’s 4th Annual President’s Award Banquet and Language Fundraiser. 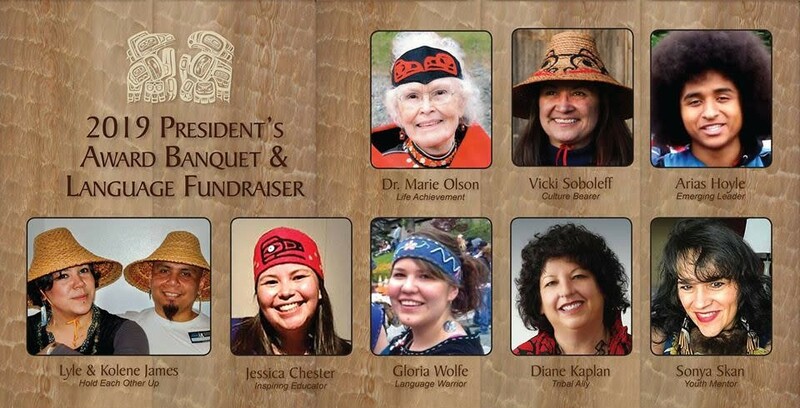 The event will be held at the Elizabeth Peratrovich Hall in Juneau, Alaska, and is an indigenous event that will honor incredible leaders throughout the Southeast Region. Every year Tlingit & Haida hosts this event to recognize a handful of those who contribute greatly to our Tlingit & Haida people, communities and culture. This event will conclude the 84th Annual Tribal Assembly, one of the most active times of year in Juneau for the Alaska Native community. The Language Warrior award recognizes a Tlingit or Haida speaker who makes significant effort to promote language preservation and revitalization in their community. X’aa L’éelk’w Tláa, Gloria Wolfe is Wooshkeetaan from Yakutat, Alaska. Her husband Góos’k’, Ralph Wolfe is Haida Kooskidee from Craig, Alaska and their two sons are Yoowáak, Jackson and Daawdunaak, Jace Wolfe. Throughout her youth, Gloria’s danced with the Mount Saint Elias Dancers and began drumming at 11 with guidance from Nellie Lord and George Ramos. She enrolled in the University of Alaska Southeast (UAS) with a scholarship from Preparing Indigenous Teachers and Administrators for Alaska Schools (PITAAS) and joined the student club Wooch.éen. While at UAS, Richard Dauenhauer encouraged her to take Tlingit Language classes at UAS. Gloria became a First Alaskans Institute Intern and worked for Goldbelt Heritage Foundation. Gloria moved back to Yakutat in 2011 to work for the Yakutat Tlingit Tribe (YTT) in their Administration for Native American (ANA) grant under the direction of Amanda Bremner. They wrote place based, culturally inspired K-12 curriculum, taught a community course, junior high and high school courses and taught elders to read and write the Tlingit language. She helped make material to teach babies Tlingit including CD’s, movieclip DVD’s and books. The team hosted 3 Tlingit language conferences. In 2014, Gloria became the Cultural Heritage Department (CHD) Director for the YTT overseeing a mentor/apprentice program ANA grant and the Johnson O’malley (JOM) program. She organized the building of culture camp cabins at the Situk River and hosted camps emphasizing art, food sovereignty and identity. Under Gloria’s direction, the Tribe purchased a 40 -foot canoe to promote physical and mental health and wellness of the Tlingit people. In 2017, the YTT received an ANA Language Nest Grant and the Cultural Heritage Department opened Haa Yaakwdáat Lingít Yoo Xatángi Kúdi, Our Yakutat Tlingit Language Nest to 14 students on January 15th, 2018. Currently, the Language Nest is in its second year and is home to 19 students. In the fall of 2018, Gloria received her Interdisciplinary Studies Bachelor’s Degree from the University of Alaska Southeast in Anthropology, English and Alaska Native Languages and Cultures. Her accomplishments are a tribute to the intergenerational strength of the Tlingit people.